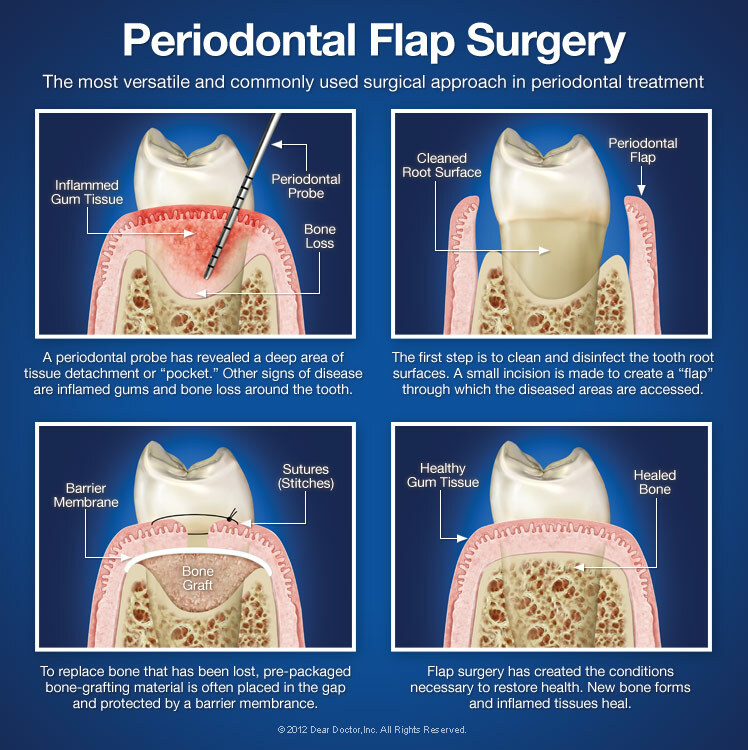 Periodontal flap surgery (gum disease surgery) is a method for treating and repairing periodontal pockets. What are these “pockets?” They are areas below the gum line where gum tissue has detached from the teeth, resulting in an uncleansable space where harmful bacteria can proliferate. These bacteria cause inflammation of the tissues, resulting in sensitivity, bleeding, and pain. Left untreated, they can cause a host of problems including gum disease, loss of the tooth supporting bone structure, and possibly even systemic (whole-body) problems. When periodontal pockets develop, the first step in treating them is usually via cleaning and scaling (also referred to as scaling and root planing) with a manual or ultrasonic instrument. If this isn't effective, then periodontal surgery is considered. Periodontal flap surgery isn't a cure for periodontal disease — but it helps create an environment that makes it easier to maintain your periodontal health. And even if you're prone to gum disease, proper professional treatment and regular care at home can help keep your teeth healthy for as long as possible. 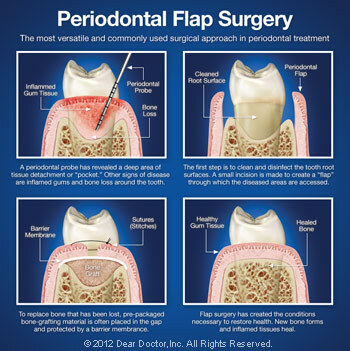 One major objective of periodontal flap surgery is to eliminate or reduce the pocket itself. To access it, a flap-like incision is made in the gum tissue. This allows diseased tissue to be removed from inside the pocket, and provides access to the teeth's root surfaces for a thorough cleaning, which helps to eliminate harmful plaque and calculus (tartar). Afterward, the “flap” is closed, sealing the area. This begins the healing process, which takes place rapidly. Periodontal flap surgery is typically done under local anesthesia, sometimes accompanied by oral anti-anxiety medications; alternatively, it may be performed under intravenous conscious sedation. After anesthesia has taken effect, a small incision is made to separate the gums from the teeth. The outer gum tissue is gently folded back to give access to the roots and the supporting ligament and bone tissue. 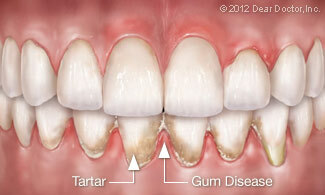 Next, the inflamed gum tissue can be removed, and the tooth roots can be cleaned; if needed, the area may also be treated with antibiotics or other medications. Bone defects can be repaired with grafting material, and proper regeneration of the periodontal ligament can be encouraged by physical (barrier membranes) and chemical (growth factors) methods. Finally, the incision is closed and the procedure is completed. Performed by an experienced hand, periodontal flap surgery has an excellent track record and offers well-established benefits.